We changed the location of our label (.ida) and Excel data source files on the hard drive. How can we update the location of the external data source file in the Barcode Label Software (BLS) itself? Because of the changes made to the file locations and external Excel spreadsheet, it is a matter of going over everything with a ‘fine toothed comb’ and reassigning the sheet (as directed earlier) and (in the BLS) going through all the barcodes and make sure they are being assigned the correct fields. Ldub13	 We had just tried copying the excel sheets and .ida files to the C drive instead of the network path. James	 Hard to say what is going on, but it might be a path issue. The BLS is really designed for a standard desktop (and local drive) use. It may be that the machine just needs a reboot, the BLS needs reinstalling, or that there is something wrong with the specified network path (the BLS relies on Windows for the file-level operations. If at all possible, I would setup the files at the local level to avoid problems. Ldub13	 Thank you for the update. 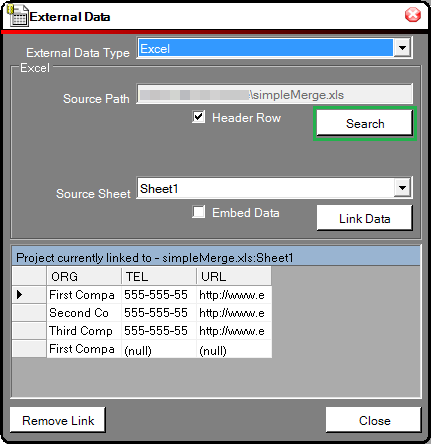 The label will not update after we change the source and link the external data. When we go to the external data, it shows as if everything is right, but it is not reflected on the label itself. 1. Open the label file in the BLS. b. Select the dataset listed from the drop-down. d.	Proceed to Search for the moved data source’s location on the drive and choose the options you want.